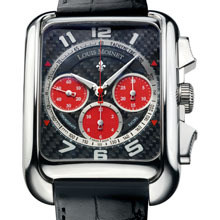 Louis Moinet is a principal sponsor of Joel Feinberg’s Primetime Racing team. The brand has found in Joel Feinberg an ideal Ambassador embodying the twin qualities of excellence and performance. Joel has inspired the creation of a new model, TWINTECH CHRONOGRAPH RACING. This highly-complex tachymeter model combines motor racing with the field of fine watchmaking through a black carbon fiber dial featuring three ultra-ligible red counters. The dial of the TWINTECH CHRONOGRAPH RACING comprises seven different applied parts. The manual adjustment of the three counters in the outer circle is an especially tricky feat to achieve. The hands are designed to offer the best readability. The tolerance in manufacturing is counted to five hundredth of millimeter. 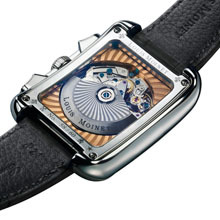 The extremely intricate self-winding movement comprises over 150 different parts. TWINTECH CHRONOGRAPH RACING is pleasant to wear. Our ergonomic studies enabled us to find a shape ensuring an ideal fit on the wrist. The lower sapphire crystal is also curved to ensure maximal comfort. After an impressive season in IMSA Lites, Joel Feinberg and his Primetime team are going from strength to strength. Feinberg, who competes back to back in the American Le Mans series logged 9 podium finishes including 5 wins, 3 pole positions and 215 championship points on his way to his first ever drivers championship. Joel Feinberg is the team owner, captain and driver of Primetime Racing, as well as a successful businessman. He is dedicated to excellence, perfection and performance in all aspects of racing and business. He was the CEO of multiple highly successful businesses, ranging from real estate to sports marketing to mass-media. Joel is the youngest ever CEO to have received the Diamond CEO Award from the South Florida Business Journal. Inspired by the ultimate endurance test for man and machine – 24 Hours of Le Mans – the American Le Mans Series is the hottest race series in North America. The series attracts some of the best drivers and most technologically advanced racing machines in the world. 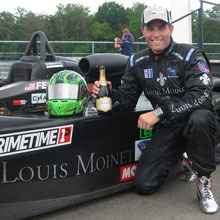 Louis Moinet is a principal sponsor of Joel Feinberg’s Primetime Racing team. The brand has found in Joel Feinberg an ideal Ambassador embodying the twin qualities of excellence and performance. Joel has inspired the creation of a new model, TWINTECH CHRONOGRAPH RACING. This highly complex tachymeter model combines motor racing with the field of fine watchmaking through a black carbon fiber dial featuring three ultra-ligible red counters. Case : 316L polished stainless steel, original design by Louis Moinet®.